Notebooks, Notecards and a Minted.com Giveaway, Oh My! If you have followed me for awhile, then you probably know about my love for Minted. I order our Christmas cards from them each year, along with notecards, business cards and have you seen their mommy calling cards?! I seriously love the concept! I love their paper quality and their customer service is the best and I know this from experience. I had a package get lost in the mail last fall and they resent me my order. It was amazing and I loved them before, but that made me love them even more. They have added notebooks to their list of awesome products and I absolutely love them and couldn’t wait to add some to our paper collection. There are a ton of different options, but we decided to go with the notebooks with our own pictures on them. I figured Teddy and Reagan would love them and I was so right. Both of the little presidents love seeing themselves on a notebook. They think it is the coolest thing ever. 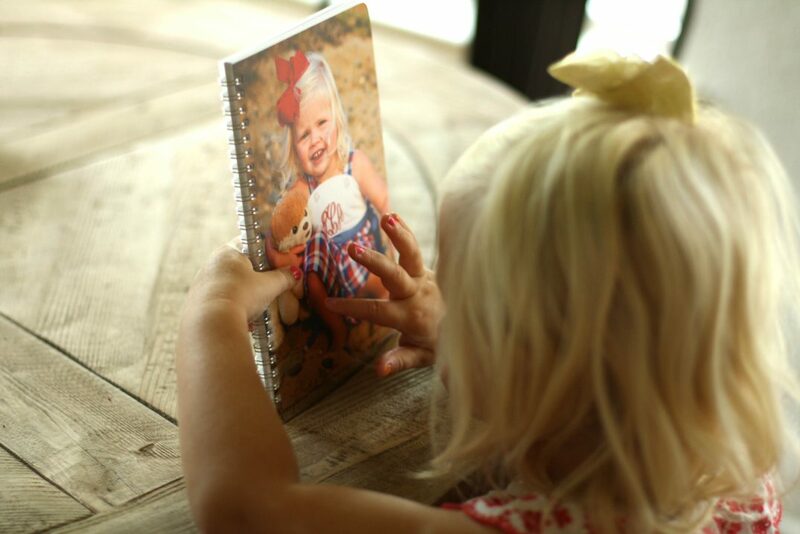 Reagan was even more amazed that her beloved Boo is on the front of her notebook. We try to practice writing every once in awhile around here. As some of you know, it’s been a bit of a struggle for Teddy, so we try to make it fun. These notebooks are definitely a fun new way to practice. 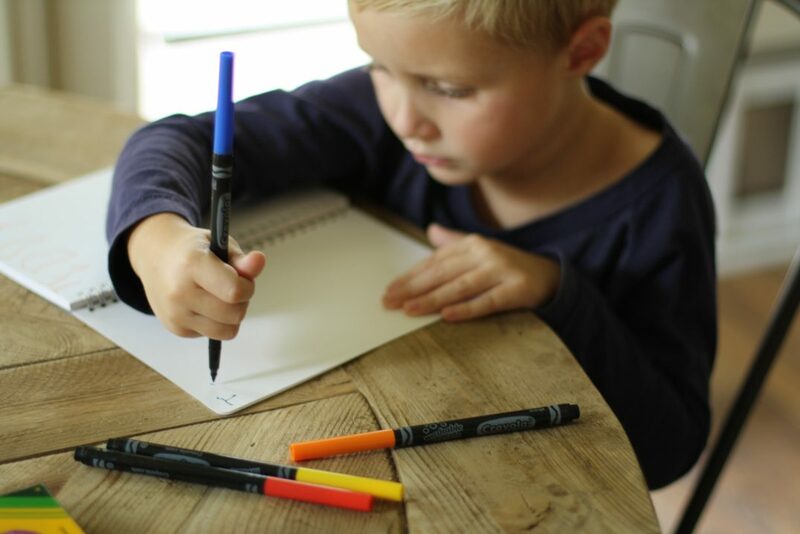 We are using our notebooks for coloring and writing, but the possibilities are endless with what they can be used for. 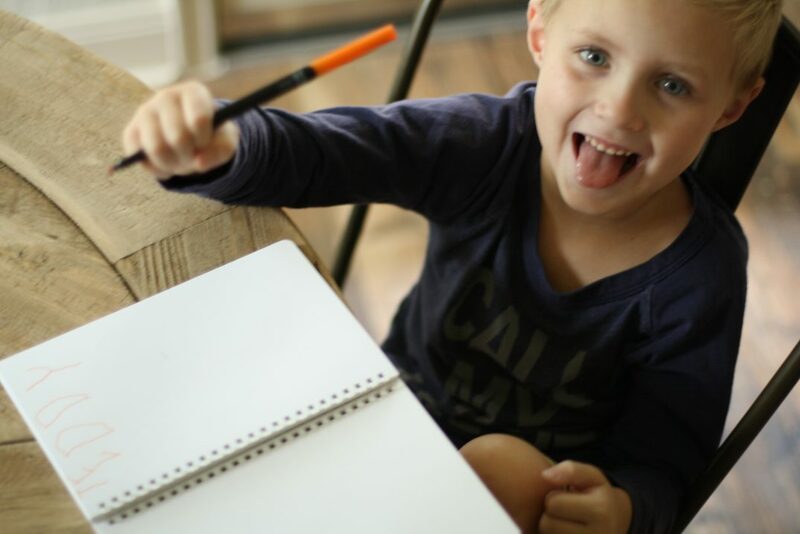 You can get them with blank pages (like we have), with lined pages (great for kids who are practicing writing inside the lines. Our letters are still large and in charge here.) and with gridded pages. You can also get notebooks in address book form, monthly planner form and weekly planner form. Not only are they perfect for kiddos, but they are awesome for you too and make really fun gifts as well!! I have been dreaming up a few gifts that I plan to order for Christmas and birthdays. We also love their notecards!! 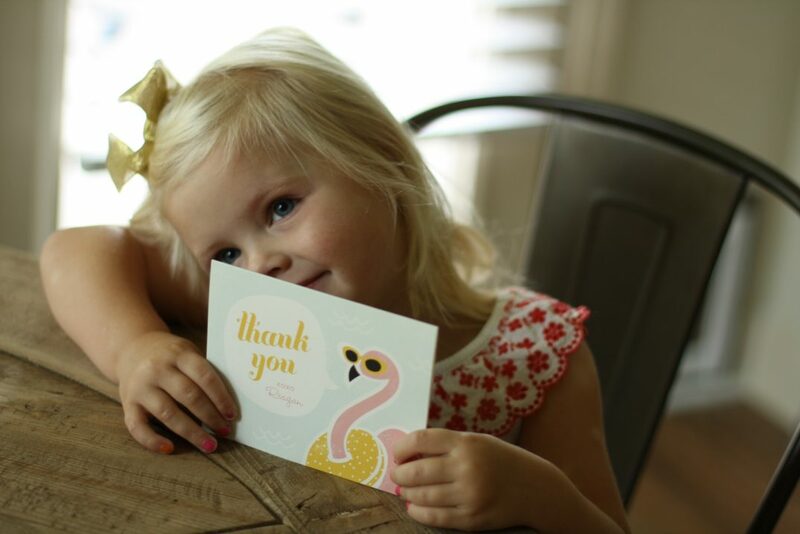 When I saw these flamingo notecards (or “mingo” as they are called in our house), I knew they would be perfect for our little mingo lover. I mean, a flamingo wearing sunnies?! These cards were pretty much made for Reagan. I have a little surprise for you today!!! TWO of you have the opportunity to win $100 credits to Minted! How exciting is that? Notebooks, Christmas cards, business cards, etc! If you win, it’s your pick!! Woohoo!!! Use the Rafflecopter below to enter! Good luck!!! Tell me, what is your favorite Minted product? Hard to pick just one, I know!!! Thank you to Minted for sponsoring this post. As always, opinions and love for this company, are purely my own. Love their birth announcements! I’m needing to order birth announcements soon for my baby boy! This is an awesome giveaway!!! Thank you! There is so much cuteness to choose from! I would probably order Christmas cards. Thanks for the chance to win! I’m loving their birth announcements as well! I love the Art Marketplace!! I love minted! I used them for my save the dates and invitations! Would love some credit to go towards thank you cards! I would love the notebooks! I LOVE the monthly planner and also your idea of a notebook for the kiddos!!!! So cute! I will have to check them out for my little ones upcoming birthday! love the notebooks with the little presidents pics on the front. Would make awesome gifts especially for grandparents for Christmas! 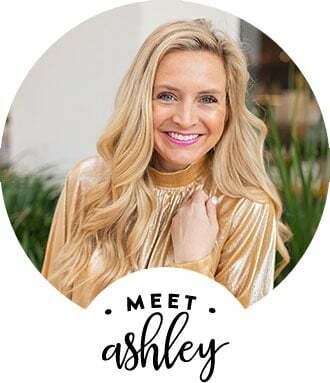 Love your blog Ashley!! I love the notebooks! So cute! I’d definitely choose one of their Christmas cards! Minted makes the BEST cards and they are really great quality! This time of year, I get so excited to order Christmas cards. And always order from Minted! My favorite is their holiday cards! They have so many to choose from, great quality and different cards each season. I would love to win this giveaway and use the credit towards our Christmas cards this year! My son’s fifth birthday is in December, and five is such a big deal to him (five? How did we get to five so quickly??? )–I would definitely use it for invites and thank yous for his special party! would love some of those notebooks! I just found out about the art marketplace! Obsessed!! I love anything stationary related! Even in our digital driven world, paper is still so fun! Notecards and notebooks are my fav! Love all of their cute products, but especially their cards and invitations!! Love the notebooks, I think my Timothy totally needs one! and the mommy cards are so cute, I think I need to order those too! I’d use the credit for birth announcements for our little girl that will be here NEXT WEEK! love the thank you cards!! what a great way to send some love! My fiancé and I will be ordering our wedding invites from minted very soon! We have fallen in love with their cute gold foil mustace and lips invites! So fun! I just love your blog and your style! Thank you so much for showing us a bit into your life! Christmas cards, love everything about them! Ash–I have been meaning to tell you about the program our preschool uses. It is called handwriting without tears. They use little crayons, (thinking you can buy them online, if you can’t find them I will ask) The program is great, Good Luck, He will get it!! Love the notebooks… so cute! I love the picture on the front with reagan and boo… way to just embrase life with your childs favorite things! love it!!! I would love to be able to afford their christmas cards! 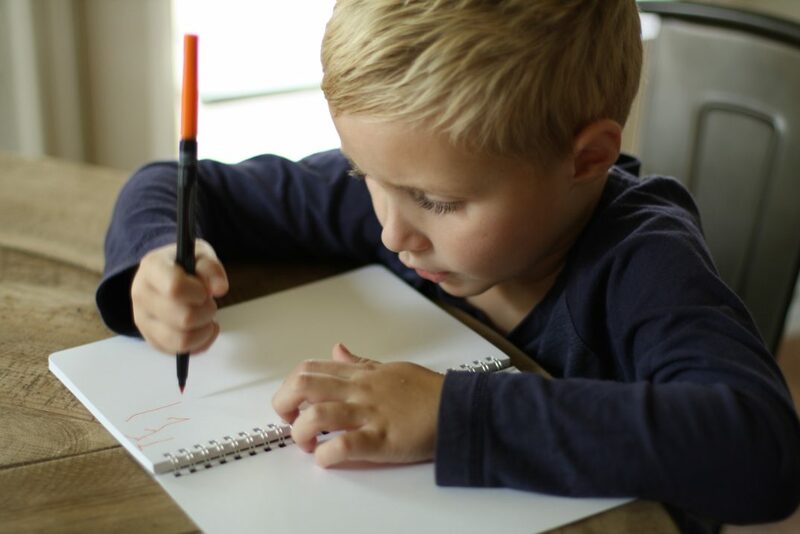 I love the idea of the notebooks for my 3 year old to practice letters in! I would also love to use for Christmas cards this year that can double as a birth announcement – our second little one is due in November! I love their baby announcements but if I win I would definitely buy Christmas cards!!! I would use the $100 credit for christmas cards! I absolutely ADORE minted! They have such amazing designs and colors! Christmas cards first, then 1st Communion invites…lov Minted for everything!!!!! Christmas cards! I love minted! I have always has a love of paper products! I’ve already been thinking about our Christmas card, and how awesome are those notebooks! Love these cute notebooks and cards! I would use it for Christmas party invites or maybe save it something cool for my son’s upcoming high school graduation in the spring. I love their photo products, cards, thank yous, notebooks, etc! I love those thank you notes!! And I would also love to do customized Christmas cards too!!! Would looove to use the credit for holiday cards – theirs are always so gorgeous! I love the Little Preseidents’ notebooks… so adorable! I would love to get a new planner from minted! Love the notebooks with kid’s picture on the front! I love their holiday cards! Its so hard to choose just one! I just got engaged in may, and so I have been looking for save the dates, so if i won I would get able to get super cute save the dates! I’ve been using Minted for personalized stationery and holiday cards for years! The new “wreck the halls” cards are hilarious and would be so fitting for my two year old son! I also love the “so festive” cards! Great sponsored post! Love these notebooks! Custom design projects are fun when the littles go to school to show them off! I would use the $100 towards wedding stationary. I’m getting married in May! Love the notebooks! I would choose to spend it on Christmas Cards!!! I would love to try out their Christmas cards, but those notebooks are super cute too! I love minted! I would get invitations for my best friends wedding shower! I love minted!! I would use the 100S for notebooks! I love the personalized notebooks, Journals, and Stationary. It would be difficult to choose my favorites. I love Minted! I have used them a few times for Christmas cards, and the quality is outstanding! I am so buying these for my niece and nephew! I will also use the credit for business cards….my company has yet to order me any and this way I het to make my own!!!!! Love love love! Minted is the best! I love their one-of-a-kind designs and the fact that they showcase different artists. IT would be cute to write quotes/stories or funny sayings you want to remember in the little presidents notebooks! We just got engaged this weekend. Winning this would be PERFECT! I love love love Minted!! If I won I would use the credit to either buy birth announcement for my baby that is due in late October or Christmas cards! I am engaged and we are in the planning process, so I would def use the credit for save the dates or invites! 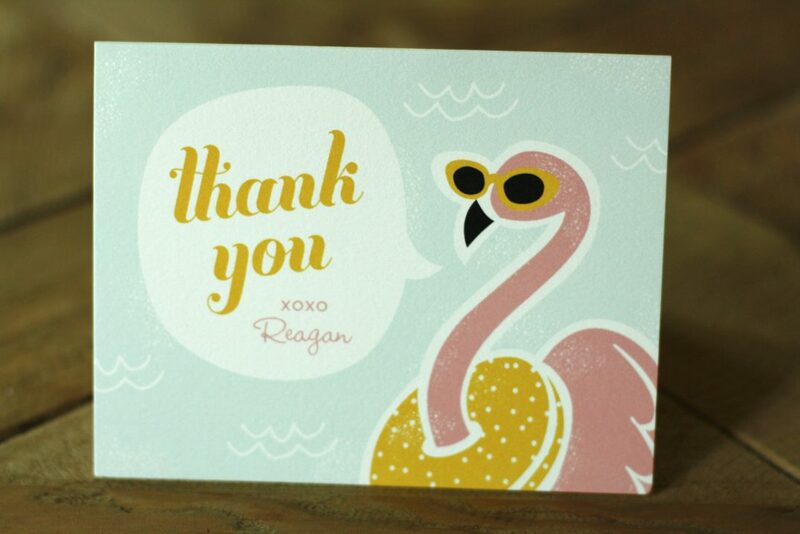 Those flamingo thank you cards are too adorable! Would love to get my Christmas cards from Minted! I love Minted! I would use it to do my family’s Christmas cards this year! I love the Christmas Cards and the birth announcements! I love the Christmas cards! Would love to get the notebooks for my two daughters! I love their birth announcements and Christmas cards. I’ve ordered both and been so impressed with the quality of the paper and product. Love everything! But I probably would go with another EC Life Planner and some of those adorable notebooks personalized for my C. Love! dying to get some of their limited edition wall art pieces to hang on my wall!! Thanks! Love love love the notebooks with the pictures!!! So fun!!! I love all their products, but I especially love their Christmas cards! Love your blog and your style. I agree with you about minted, excellent customer service and high quality products! Those notebooks are adorable! I keep a notebook by my bed and jot notes to my daughter in it – funny things she says, things to remember, or just notes to her. These notebooks would be great for that! I also love their baby announcements. I’ll have to peruse those soon! new to your blog, and loving it! I would love love love to get my littles a notebook like this! Adorable! I love the “Mingos”! I love minted and I totally would be using that credit toward some christmas cards!! Thanks! I always am in charge of designing our Christmas cards for our family….these may be the perfect cards for this year! Can’t wait! I LOVE stationary. I would purchase maybe purchase thank you cards for graduation! I am so loving your blog and posts! Thanks for sharing! I’d get the hello darling stationary or some other stationary. I love snail mail! I would definitely get Christmas cards! I’ve never seen so many amazing ones in one place! I love the notebooks and business cards! So so fun. Love it all girl! I love a notebook!!! I love their Christmas cards! I absolutely love Minted Christmas Cards and address labels! I’d totally buy some custom graduation announcements!! I have always wanted to get my Christmas cards from minted! The kids I babysit would LOVE the notebooks with their pictures on it, and I would love Christmas cards from here! Would definitely get baby announcements for the baby boy I’m expecting in late December! Thanks for the giveaway! I must order these for my little loves. Cute idea with their pic on a notebook. Thanks. i would love to order some personalized thank you cards for my little ones as well as myself!!! Christmas Cards!!! Although those notebooks are adorable too. 🙂 Great giveaway! These notebooks and cards are darling, like your family!! Love the idea of their own personalized notebook! My 3 yr olds would love them! This would be amazing for Christmas cards!! I used them last year for my christmas cards and got so many compliments! Looking forward to using them again this year! I think my baby girl needs those mango notecards! We’re thinking of doing a flamingo first birthday party for her! I love the little notebooks..soo cute! I would buy christmas cards for my first married christmas! I need a new planner and probably get some Christmas cards. My Christmas cards were my fav so far! Such great quality! this giveaway is perfect and would totally come in handy with my little bump on the way! i really adore the handwriting assistant and all the christmas designs! I love Minted …….I would use it for thank you cards for my little ones first birthday!! I would love to win this! I’m getting married in three and a half weeks and would love some cute thank you notes! I love BOO is on the cover & I saw on instagram you sent out little presents with these to andrea and Shay! I love the notebooks with the photos on the cover. I’d get one with my little boy’s face on the cover and use it as a journal for all of the cute things that are coming out of his two-year-old mouth these days! I would use the 100 gift for our christmas cards this year…showing off our first home and new puppy! Thanks!! I love paper products! I would definitely use the thank you notes for christmas and birthday gifts and the other products to add a little fancy to my life! I would use my $100 for cards for my blog! I am working on building it up, and everything helps! I already shopped their designs, and wow! They are so adorable and stylish! Love them! I love their wall prints and those notebooks!! this is awesome! i’m newly engaged and these would come in very handy! These flamingo cards are a must have! Christmas Cards!!! We did our first Christmas cards last year through minted and I love their foil press option!! Either Christmas cards or new stationary! I’m all for Christmas Cards and may even tuck in a notebook into my order. I would use it for invitations to my daughter’s 1st birthday! Love this and your site, Ashley. 🙂 Way cute. Would love to win! I love the notebooks and the Christmas cards! I would love to get some of their cards for the holidays!! I would order Christmas Cards! The BEST!! I always love Minted’s Christmas cards. It looks like I need to check out the rest of their selection as well! Minted is my go to place too! I love them and am super excited to pick out my Christmas cards for this year! yay for Giveaways! Love! This will be perfect for the holidays coming up! I would love to use the credit for Christmas cards this year. My husband and I had our first child this year and I have been dying to get nice photos taken to send out on our cards! Thanks for the giveaway! Holiday cards! I used them for my wedding save the dates, and have lived them ever since! love all their products! would be so hard to choose but probably christmas cards! I love the birth announcement!! And Christmas cards!! First time on minted and i love so many things. we are welcoming our second child in 6 weeks so i would love to win and purchase so adorable birth announcement cards. I love a good notecard! I enjoy sending snail mail! I would love to send out some lovely Christmas cards this year!!! The Hello Darling Notecards are precious! Would be such a treat to use towards Christmas cards…they have such fabulous options! Yay! I would use it to pay for some cute Christmas cards. I love Minted! Always been impressed with their Christmas cards! I would buy note cards for writing notes or letterhead because I really miss the art of letter writing and intend to send someone a note or letter daily! I would love to order Christmas cards through Minted! They are beautiful cards! I love the Our Story Save the date cards, but all of their wedding stationery is great! all things are so awesome….but the cards are the very best!! Would use for my son’s birthday invites! The notebooks are so cute! My little one would love that! Minted.com- how could I have never known about this before?! what a GREAT site! I want ALL the things…I especially love the notebooks. I would love to win birth announcements for our little one in December! I love everything from minted, but I especially love their Christmas cards! I’m excpecting, so I would use this for baby announcements! I would love to get Christmas cards for our first as hubs and wife! Last year was my first year to order Christmas cards from and hands down they have been my best card yet! the quality was outstanding and the turnaround was wonderful (I’m kind of a last minute-r!) I would love love to add notebooks as a purchase as I know ill will use them again for my christmas cards!! I love minted and can’t wait to order Halloween cards!!! Thank you for the giveaway! although it is so hard to pick, i think i would have to go with christmas cards. Last year, their selection was hands down the best! My Son’s 3rd birthday could use some Minted thank you notes!!! I love their Christmas Cards. Great giveaway!!!! would love those christmas cards! totally adorable!!! Those notebooks are adorable! 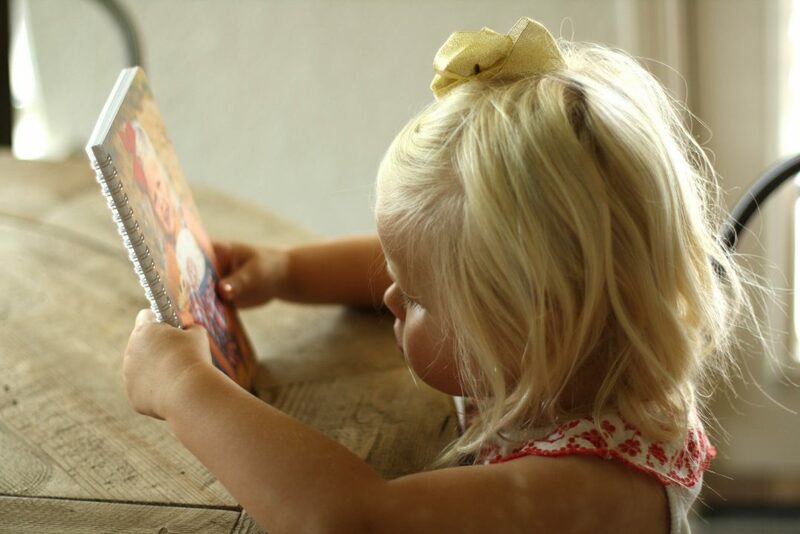 My daughter loves paper books so she would love one with her picture. Love the gold foil Christmas cards. I would get some personal stationary and a new day planner for 2015! I would use them on our save the dates. Would love to win! I love Minted products! I would use the gift card for Christmas Cards and thank you notes! Would love to use Minted for my Christmas Cards this year! I love their notebooks!! So adorable! And I’m always looking for a cute place to jot down my random thoughts and lists! I’d use it to have the fanciest Christmas cards ever!!! I would use credit towards birth announcement! We are having a boy Nov 14! Also Christmas cards!! Hope I win!! I want to make birthday or holiday cards to send out!! I would love their planners! Beautiful and functional! You can’t go wrong! I would love to order our Christmas cards. I love Minted’s stationary!! So many options and all so beautiful. We are moving so I would use it for our moving announcements! I love minted! by Kristen Smith holiday card. I would order xmas cards – I ordered from Minted Last year also. I would use it on their holiday cards or notebooks! I had never heard of mommy calling cards before, but I will add those to my list once we have kids, lol! This year I am crossing my fingers to have a new house and a puppy for this years Christmas card.